GFMS survey puts China top consumer, miners in dire straits and gold price likely to slip this year before recovering later on. The latest Gold Survey from Thomson Reuters GFMS holds out few surprises coming to very much the same conclusions as others of this ilk from Metals Focus and CPM Group. It does however put China back as the global No. 1 gold consumer last year – contrary to the suggestion noted in the World Gold Council’s Gold Demand trends in february which suggested India may have overtaken China again – presumably at the time also on figures supplied by GFMS. Like most markets, gold takes time to recover from periods of turbulence and in early 2015 it is continuing the stabilisation of 2014 following the hurricane that swept through it in the previous year. Demand contracted sharply in 2014 as some key regions, notably China, suffered from over-purchasing in 2013, while lack of confidence in any near-term price recovery deterred investment purchases elsewhere. There are signs that confidence is starting to return, however, as the physical market adjusts and takes comfort from the price stabilisation since November 2014. In the western markets in particular, dollar strength and the focus on FOMC policy has remained to the fore. While US monetary policy will remain a central focus over the course of 2015, investors are already discounting a return to a rising interest rate cycle (albeit gradual) and it is arguable that loose-handed holders are out of the market. This does not automatically signal higher prices however, as these require fresh investment activity; indeed there is still the possibility of short-side sales in response to any unsettling news or economic development. Once the new rate cycle is in place (or signalled), asset reallocation is likely to commence and we expect gold to benefit accordingly. The dollar is likely to retain currency supremacy, given monetary policy elsewhere in the world, and non dollar-denominated gold prices are believed to have bottomed. In dollar terms, however, the GFMS team at Thomson Reuters is looking for further slippage towards $1,100/ounce during 2015, with an annual average of $1,170/ounce in 2015, with prices rising towards year-end; this should lead to an average of $1,250/ounce in 2016 as buying picks up in Asian markets and institutional investment in these markets offsets the recent decline in Over-the-Counter demand in the West. Official sector purchases the second highest total since the end of the gold standard. Official sector gold transactions in 2014 amounted to an estimated net purchase of 466 tonnes, up 14% from 2013 and the second highest level since the end of the gold standard. Heightened political tensions in 2014 saw Russian central bank reported gold purchases reach record levels at 173 tonnes, while several CIS countries increased their gold holdings. Sales remained muted. The sector is expected to remain a source of demand for gold over the medium term. The renewed eastward shift in physical gold demand (following the westward lurch following the start of the financial crisis) stalled last year, but is expected to resume as the markets continue to stabilise. This will, in GFMS’ view, give the gold market fresh stability in the near to medium term. The appetite for gold in the East was well-illustrated in 2013 and, as stocks are worked off and confidence returns, we expect the Asian markets to reassert their power in terms of price support. World jewellery fabrication– excluding China – actually increased by 6% in 2014. The result of the massive surge in jewellery demand in China in 2013 was a fall of 35% in Chinese jewellery consumption and 31% in local jewellery fabrication last year. Even so, Chinese jewellery fabrication in 2014 was 7% higher than in 2012 and the second highest on record. Heavy leasing activity in the local market has led to suggestions that retail demand was much higher than was actually the case. India, despite import restrictions, reached another record in both fabrication and consumption terms, reflecting the determined affinity of the Indian people for gold. China and India between them accounted for 54% of the world’s jewellery, bar and medal demand in 2014. Overall investment demand was the fifth highest on record, despite year-on-year contractions. The retail coin and bar market was the one that really suffered in 2014, slumping by 40% year-on year, driven particularly by the Asian markets, reflecting the action of 2013 and unease over the price outlook. Elsewhere in the investment sector, ETF holdings continued their erosion, albeit at a much slower rate than in the previous year. The gold mining sector remains in a precarious condition. While production expanded in 2014, to 3,133 tonnes, this reflected a ramp up of previously commissioned projects. Output is expected to be flat in 2015 as this impact wanes, before starting a palpable decline. All-in-Costs dropped by 25% to $1,314/ounce in 2014 (the average spot price over the year was $1,266.40), although this fall was distorted by the large number of impairments incurred in 2013. If these are stripped out then the fall was much more modest at 3%. Average total cash costs decreased by 3% to $749/ounce, reflecting advantageous foreign exchange rate movements and higher processed grades, while labour costs and lower by-product credits were adverse factors. Corporate activity in the gold mining industry continued to decline in 2014, with aggregated deals amounting to just $7.3 Bn, approximately 9% lower than in 2013 (data from ThomsonOne Investment Banking). Miners’ priorities focused largely on rationalising existing portfolio and strengthening balance sheets by reducing debt levels while deteriorating sentiment drove the determination to increase efficiency. Hedging, at 103 tonnes, was the highest since 1999, but the GFMS team does not believe that this is a turning point to widespread hedging activity, as it remains confined to a small subset of producers. This year may see net hedging, but it is likely to be of a comparable scale to that of 2014. Latest figures from the Shanghai Gold Exchange show that just over 70 tonnes of gold were withdrawn from the SGE for the week ending Jan 16th. 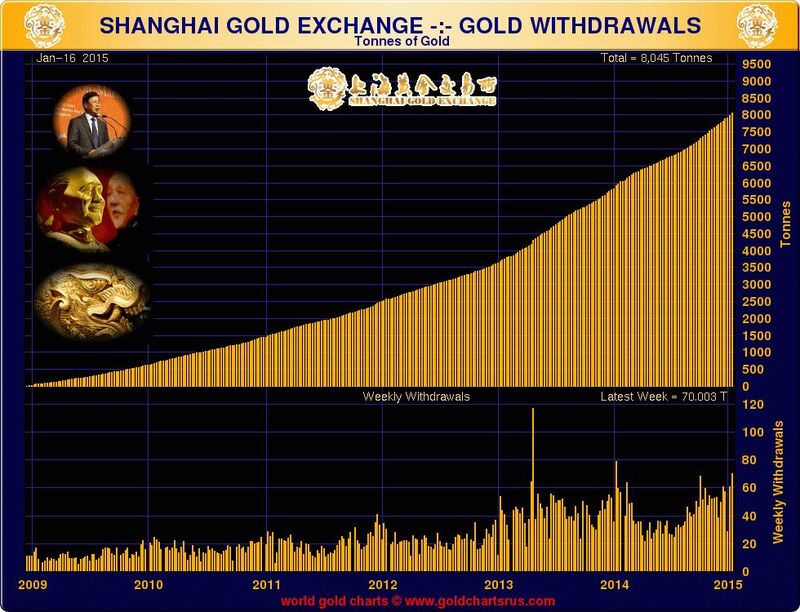 This is the 3rd highest level of gold withdrawals ever recorded by the Exchange and suggests that Chinese gold demand remains extremely strong in the runup to the Chinese New Year which falls on Feb 19th this year. With four weeks still to go until the actual New Year date, if this level of gold demand holds up given the higher gold price, China will show a very strong start to the year, buying up far more than the global total tonnage of newly mined gold over this period on its own. A more detailed analysis of what the latest figures imply may be viewed on the Mineweb.com website. Gold demand in China remains strong in the build-up to the Lunar New Year, with gold price premiums on the SGE rising to 7%. Article as published on Mineweb.com . Check out Mineweb for more articles on mining, metals and minerals. 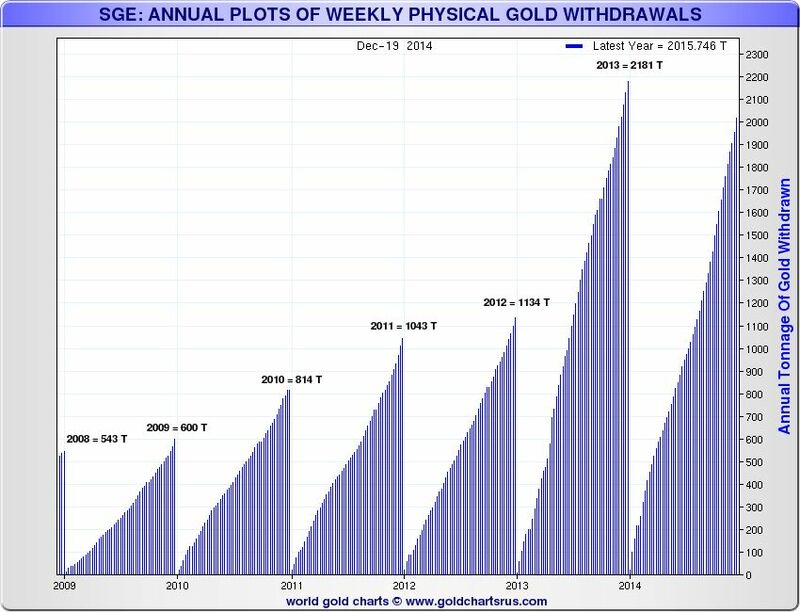 In releasing the latest information on Chinese gold withdrawals, the Shanghai Gold Exchange (SGE) both confirmed that total withdrawals for the year came to over 2,100 tonnes, only 3.6% down on the previous year’s record, but also that withdrawals for the final three trading days of the month amounted to some 29 tonnes suggesting that demand remains strong ahead of the Chinese New Year. Indeed with a longer runup to the Lunar New Year this year – the actual date is February 19th – the second latest date in the Western calendar on which the Chinese New Year can fall, we can expect strong gold withdrawal figures out of the SGE for both January and February. In the Chinese Zodiac 2015 is a Sheep year (also known as Goat or Ram year) and denotes both calmness and prosperity. If last year’s pattern of gold buying ahead of this date is followed then January could be a very big month for Chinese gold demand indeed. Last year gold withdrawals from the SGE that month were actually substantially higher than at the start of the record 2013 year – and if demand in the last quarter of 2014 is anything to go by, they could be at close to record levels again this year. Traditionally Chinese New Year celebrations involve gold gifting, and January tends to be the month that gold traders and banks stock up ahead of the date and holiday period surrounding it. Anecdotal reports suggest that this is already the case with high demand levels already being seen at the beginning of the month. Reuters reports, for example, a Shanghai trader as saying “We saw consistently strong buying this week, premiums and volumes are better than what we saw in the last month.” As confirmation SGE premiums for gold have risen to $7 an ounce as demand grows. Withdrawals from the SGE have been averaging over 50 tonnes a week for virtually all of the past three months. With the actual date of the Chinese New Year falling more than 2 weeks later than it did last year when it fell on January 31st we can probably expect a slower, but more prolonged, build-up this year. Judging by the increased premiums, if the Shanghai trader is correct we could also see something of a boost in the early January figures. The latest weekly gold withdrawal figures from the Shanghai Gold Exchange suggest that Chinese demand is going to get far closer to last year’s annual figure than most mainstream news media would have you believe. (SGE withdrawals are the best available proxy for actual Chinese demand). The latest figure for the week ending December 19th was a large 60.67 tonnes bringing the year to date figure to 2,015.75 tonnes, only 165 tonnes short of last year’s 2,181 tonne record. With 1 ½ weeks of SGE withdrawal figures still to go until the year end, if withdrawals continue at the current rate it will bring this year’s total to around 2,100 tonnes – only around 4% off last year’s record figure. It is reckoned, perhaps arguably, that SGE withdrawals equate to total Chinese gold demand – but even if they don’t they do provide an excellent year on year comparison of true Chinese demand figures. See chart below for comparisons with prior years from Nick Laird’s excellent www.sharelynx.com and www.goldchartsrus.com websites. Nick is a close follower of all kinds of global statistics which he publishes in graphical form and he and Koos Jansen on www.bullionstar.com are the most reliable followers of Chinese gold statistics. Koos will probably see Chinese demand figures as a few tonnes lower as the SGE figures also include movement through the new International section of the Shanghai Exchange (the SGEI) where trade is not necessarily landed on the mainland, but currently volumes are thought to be very small so will make little difference to the overall picture. Together with the huge recent gold import figures emanating out of India (see: Indian Summer for Gold and Silver. Can it go on? and reports of strong demand in European nations where there remain substantial doubts about economic recovery, there seems to be little doubt that currently gold demand is exceeding new supply – possibly comfortably. There have been relatively high sales levels out of the gold ETFs in recent months which will have helped balance the figures but these have been nothing like last year’s bleed from this source. With the weaker ETF holders falling away this will become a diminishing source of gold for the world markets. So it looks as if global gold demand is ending the year on a strongish note. The gold price yesterday kicked back close to the $1,200 mark after being taken down to the low $1,970s in thin trade just before Christmas. There does seem to be good support in and around the $1,190s, although a decisive break back above $1,200, while on the cards, is proving difficult to achieve.